On Mondays and Saturdays, Paseo Boricua comes alive with drums blasting from AfriCaribe, the cultural landmark that’s celebrating ten years of educational and cultural programming. Learn how to drum or dance rhythms of bomba, which originated in Puerto Rico during slavery. In bomba, a dancer’s body movements lead the main drummer. In other words, dance creates music. If you’ve never experienced bomba, you have to check out one of AfriCaribe’s bombazos. They take place the last Saturday of the month, and everyone is welcome to drum, sing, and dance. In addition to bomba classes, AfriCaribe offers capoeira and karate. Register for spring term on April 12th from 6-8pm. Classes begin on April 24th and cost $50 for adults or $35 for children. 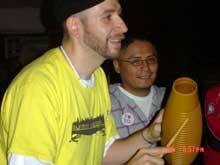 Every Saturday from 2 to 4 p.m., adults and children turn a large gymnasium into a mecca for Latin percussion aficionados. Housed on the second floor of a community center, El Ritmo School brings Latin percussion to the masses by offering free–yep, yep, gratis–instruction. Students learn a variety of instruments, from maracas to guiro to congas to timbales, as well as popular rhythms, such as merengue and cha-cha. Get your groove on at El Ritmo, where you’ll be given a set curriculum that you can follow at your own pace. Located in a cozy storefront in the heart of Ravenswood, Manigua will get you moving with a creative assortment of world percussion and dance classes. You can learn conga and Brazilian percussion as well as salsa dance, belly dancing, bollywood dancing, bomba dance, music theory, writing, and more. Stretch and relaxation classes are free. With Manigua’s small class sizes (never more than 10 students), you’ll get the personal attention and instruction you need. 8-week drumming courses run $125 while 4-week dance classes run about $50. Check out Manigua’s calendar for class dates and times. Segundo Ruiz Belvis Cultural Center, the oldest Puerto Rican cultural center in Chicago, is one of the few places that offers plena workshops. In the plena workshop, you’ll start off each class listening to original plena before you start drumming, dancing, and singing. Even if you don’t sing like La India (I sure don’t! ), you’ll have a lot of fun anyway. The center also offers bomba percussion, song, dance, and history workshops and bomba drum-making workshops. Workshop prices vary, with some 4-week courses running $40. Bailes de Bomba take place every second Friday of the month with bomba drummers and dancers from around the city. So check out their websites, stop by for more info, or drop in on a class. I’ve taken courses at all of these places, and believe me, you’ll have a lot of fun, meet new people, and learn a lot. Stay tuned for features on each of these places for an inside look on their histories and classes. Additional courses are also offered at Old Town School of Folk Music. With locations in Lincoln Park and Lincoln Square, Old Town offers 8-week conga or cajón class for $160 and several one-time percussion workshops for $20. The Music Institute of Chicago, with locations from the North Shore to Downers Grove, offers world drumming as well as 15-week Brazilian percussion and samba courses for $155.